This view from space of a solar eclipse was captured on April 29, 2014 by the European Space Agency's Proba-2 satellite. The same satellite will observe the total solar eclipse of March 20, 2015. A fleet of European satellites will chase the only total solar eclipse of 2015 from space on Friday (March 20) in a bid to capture truly out-of-this-world views of the celestial event. 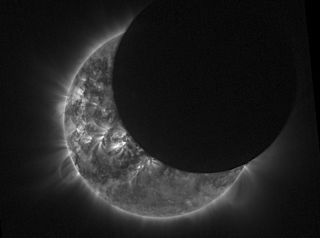 The European Space Agency's Proba minisatellites will observe Friday's total solar eclipse — which also coincides with the first day of northern spring — with one spacecraft watching the moon as it blocks the sun while others track the moon's shadow on the Earth's surface. You can watch the solar eclipse live online beginning at 4:30 a.m. EDT (0830 GMT), courtesy of Slooh.com. This map shows the predicted path of the total solar eclipse for March 20, 2015. Friday's eclipse of the sun is one of two solar eclipses in 2015, but the only one in which the moon will appear to completely block the sun. To mark the event, ESA will host an eclipse-watching party at its Space Expo visitor center in Noordwijk, Netherlands — where only a partial eclipse will be visible — for the public to look at the solar eclipse from the ground and watch Proba 2's work. Times for the eclipse vary by location, but in Noordwijk, the eclipse will begin at 9:30 a.m. local time (4:30 a.m. EDT, or 0830 GMT). he partial eclipse will reach its maximum extent at 10:37 a.m. local time (5:37 a.m. EDT, or 0937 GMT), when the moon will cover four-fifths of the sun. The eclipse will finish at 11:48 a.m. local time (6:48 a.m. EDT, or 1048 GMT). Solar eclipses occur when the moon passes in between the Earth and the sun, from the Earth's perspective. From Earth, the moon and the sun look about the same size, so during a total solar eclipse, the moon blocks out all of the sun's light. But that only occurs when the two bodies are perfectly aligned. "The path of 'totality' next Friday — where the sun is completely blocked — will trace a small band across the North Atlantic, including the Faroe Islands and Svalbard, the latter home to an ESA ground station from where eclipse images will be broadcast," ESA officials said in a statement. The online Slooh community observatory will webcast live images from the Faroe Islands, where the eclipse will make its first landfall. The totality of the eclipse should last about two minutes in the capital city of Torshavn when it occurs at 0941 GMT, according to a Slooh alert. "The eclipse occurs about 15 hours before the March equinox as the sun crosses the celestial equator moving north," Slooh representatives wrote in a statement. "So an observer at the North Pole, where the solar eclipse ends, would see an extraordinary sight: an eclipsed sun just emerging above the horizon for the first time in six months." certified equipment, such as solar eclipse glasses or a solar telescope, under expert guidance." ESA is not the only one hoping to get an amazing view of the total solar eclipse from above Earth. The Spain-based company Zero 2 Infinity plans to launch a balloon high into Earth's stratosphere to capture photos of the solar eclipse from inside the moon's shadow. The company has been raising funds to support the expedition on IndieGoGo under the name bloon: 360view of a Total Solar Eclipse. A total solar eclipse is considered one of the most spectacular events in nature, mainly because the sun's outer atmosphere, called the corona, becomes visible when the moon passes in front of the sun. But observing solar eclipses, whether total or partial, requires caution, ESA officials warned. "Please take care if you are fortunate enough to be watching this event: Observing the sun with the naked eye is extremely dangerous and can lead to permanent blindness," ESA officials warned in their statement. " Please use certified equipment such as solar eclipse glasses, or a solar telescope under expert guidance." Editor's note: If you SAFELY observe Friday's total solar eclipse and would like to share photos, videos or comments on the experience with Space.com for a possible story or image gallery, send photos and comments in to managing editor Tariq Malik at spacephotos@space.com.